NativeAmericanJewelry.com invites people to take part in their new release of fashion’s oldest and longest-lasting trend, the bolo tie. The jewelry piece stands as a symbol and testament to the strength and beauty of the American Southwest. The striking designs appears as the perfect look for the Hippie Chic style that dominates festivals, fashion, and youth culture. 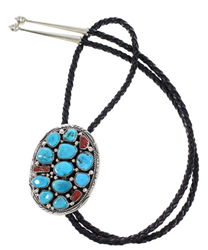 Since the early 20th century, bolo ties began as a strict Native American fashion. However, that quickly changed when trading resulted in the growth of this pieces popularity, starting in Arizona and quickly sweeping through the entire Southwest region. Today, 2016 has seen a revitalization of both the Native American culture as a whole and stunning bolo tie art as a byproduct of that fact. NativeAmericanJewelry.com, a company that has honored and celebrated the heritage of the artists they represent, is proud to launch a new release of bolo ties to celebrate fashion designers and civil rights leaders across the country that have fought for the continued growth and well-being of Native American culture. From the recovery of an ancient Acoma shield from being sold in a private auction in France to their continued struggle to save the remanence of an entire Native American village from the construction of the Keystone pipeline, Native American culture has continued to fight for their history and culture. The team at NativeAmericanJewelry has found that the resurgence of Native American culture in the general public has even impacted the women’s fashion industry. The striking designs appears as the perfect look for the Hippie Chic style that dominates festivals, fashion, and youth culture. NativeAmericanJewelry.com works with some very talented silversmiths and artists, like Zuni artist Bobby Shack. Shack is best known for his stunning silversmith and stone-setting skills that bring life to the vibrant figures he creates from Native American lore. Irvine Chee is another talented artist, from the Navajo Tribe, that uses striking red coral and beautiful blue turquoise to create visually appealing works of art. Among the new collection of Native American and Southwestern style bolo ties, guests can find vibrant Turquoise and Coral, to name a few, set into sterling silver and looped through with quality leather made by talented Navajo, Zuni, and Hopi silversmiths.